We had previously reported on what the media and the U.N. are calling the worst food crisis since World War II - a crippling drought and famine spreading across Africa and the southern Arabian Peninsula where twenty million or more are now in imminent danger of starvation. This tragic situation instantly caught my attention, because though we've seen earthquakes and roaring seas and signs in the heavens (see here and here) and wars and rumors of war in fulfillment of Jesus' prophecies of "birth pains", famines (Luke 21:11, Matt. 24:7) have been few and far between over the last decade. Not anymore. I would urge everyone to pray about donating to a vetted organization. 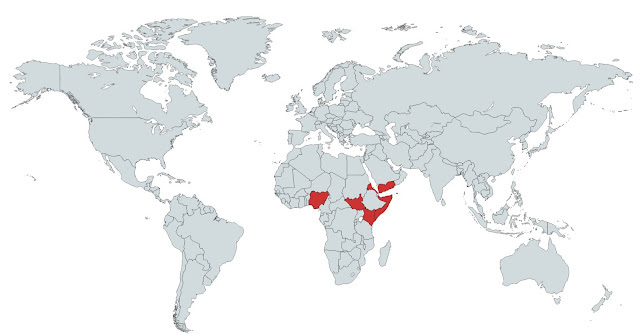 Many orphans and widows in these regions. Egypt is on the verge too--they're facing drought and loss of farmland due to salinity in the Nile delta. Soon Ethiopia's Grand Ethiopian Renaissance Dam will start to fill, depleting the Nile further, per Isaiah 19.